Wendell Fenton. Born 5 Sept. 1902 in Fort Meade, South Dakota. Died 30 April 1904 in Washington, D.C.
Martin Fenton. Born 7 Jan. 1908 in Washington, D.C.
STURGIS -- The Fenton brothers found a piece of their family history at the Fort Meade Museum on Monday. Bill Fenton, 66, of Scarborough, Maine, and his brothers, Griff, 64, and Nat, 62, both of Lamoine, Maine, came to Sturgis to view their grandfather's long-lost military commission and saw something that Capt. Charles Fenton probably never laid eyes on in his own lifetime -- the 1901 document signed by President William McKinley promoting him to the rank of captain in the U.S. Army. the Fort Meade Post Office, seen in the background. "We had absolutely no clue about any of this," Bill Fenton said. 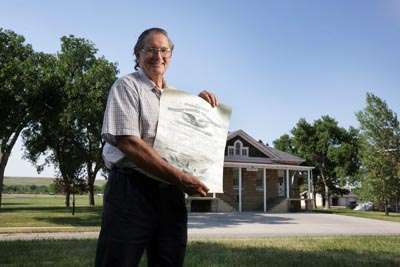 That 108-year-old document mysteriously showed up in the morning mail at the Fort Meade Post Office in March 2008. Addressed to Capt. Fenton, its late arrival confounded Postmistress Kathy Wacker and Charles Rambow, director of the Fort Meade Museum. A Rapid City Journal article last year about the unusual delivery led Lori Potts of Rapid City to track down the soldier's descendants in Maine. "It only took me an hour to find the grandson," said Potts, a genealogy buff. "If that were my ancestor, I'd want somebody to try to find me, so I would know." After learning of the presidential proclamation's existence, the three brothers, along with Nat's stepson, made plans to ride motorcycles out from Maine to see it. They were met by two of their wives who flew into Rapid City on Sunday. Potts met Fenton family members Monday at Fort Meade. "Very nice people," Potts said. "They were very grateful." Capt. Charles Fenton died in 1918 when his youngest son, William, was just 5 years old. Only two of his five sons lived to adulthood, according to military records from the Arlington National Cemetery Web site. William Fenton told his children about their grandfather's military service, and they grew up knowing that he was buried at Arlington in Washington, D.C., but they had no knowledge of his service at Fort Meade. William died two years ago. "He would have been incredibly proud to see this and to hear about it," Bill said about his father. Seeing the document connected him to his grandfather in a palpable way, Fenton said. "I looked at it and felt a great deal of pride. It was just amazing to me that it was signed by President McKinley. I got chills reading it." Like Rambow, the Fentons remain in the dark about the document's whereabouts between 1901 and 2008. "I don't have a clue," Fenton said. "The amazing thing is how it got there with just Captain Fenton's name and Fort Meade, South Dakota, written on it." Family members say they'll get copies of the parchment-paper commission made, but they want the original to stay exactly where it is. "We were very impressed by the display they've arranged for it up there," Bill Fenton said. "It's definitely in the right place." VINEYARD HAVEN, Massachusetts - March 17, 1932- Mrs. Alice Rochester Fenton, widow of Colonel Charles W. Fenton and daughter of the late General William B. Rochester, died today at the Martha's Vineyard Hospital. She was born 56 years ago at Louisville, Kentucky, and for many years was prominent in Washington society. She leaves a brother, Colonel William Fenton and two sons.